For many, January is a time to reflect and institute personal growth goals. Eating with a more local focus is a great goal in this (and really, every) season! To that end, lettuce wraps are a way to get a boon of extra veggies in your diet, and you can readily find locally grown lettuce during this time of year. Tasty fillings of all kinds are fantastic to wrap in leaves of our romaine lettuce, and you can nosh happily knowing that you incorporating locally grown and nutrient rich foods into your diet. 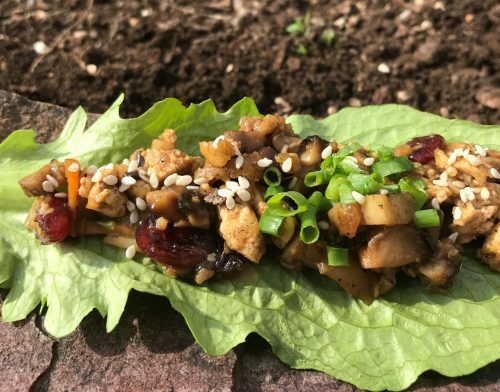 This recipe uses Crabtree romaine lettuce, shiitake mushrooms, carrots, garlic, and green onions in a delicious vegan dish that even meat lovers can appreciate and enjoy. Toss in some cooked brown or red rice for an even more filling meal. Hope you enjoy wrapping with our crisp (non E. coli contaminated) romaine lettuce this winter. Crumble tofu with your hands or mash it with a fork. Heat a large pan over medium-high heat, add two tablespoons of oil and fry the tofu, stirring regularly, until browned. Transfer to a bowl and reserve. Add a touch more oil to the pan if it looks dry and fry the ginger, garlic and white parts of the onion, stirring, until soft and fragrant. Add the chopped mushrooms and fry until soft and beginning to brown. Finally, add the carrot and water chestnuts and fry until the carrot is crisp-tender. Combine the hoisin sauce, soy sauce, vinegar and sesame oil in a bowl. Add the tofu back to the pan and mix in the sauce. Turn off the heat and add the cranberries and green parts of the green onion. Taste and add salt if necessary. Serve in the lettuce leaves with sprinkled with sesame seeds.